Having read mixed reviews, I waited until Tomorrowland came out on cheaper streaming services. Directed and mostly written by Brad Bird, auteur of brilliant work like Iron Giant and The Incredibles, the previews looked promising — a story about the shiny visions of the technological future we had as kids in the 1960s, and a world where they actually happened. The first two-thirds of the movie are great — the young heroine gets into trouble for trying to save a NASA launchpad from demolition. The failure of dreams and a rising tide of pessimism have left the world obsessed by dark visions of dystopic futures. Then she finds a pin which, when touched, transports her to Tomorrowland, which riffs on Walt Disney’s vision enshrined in the eponymous part of Disneyland. There are several Disney in-jokes, like one robot’s insistence that she’s “audio-animatronic,” Disney’s term for lifelike automatons. Tomorrowland is congruent with Earth but in another dimension, and was founded by Tesla, Edison, Jules Verne, Gustave Eiffel, and similar geniuses as a place for the best and brightest scientists and artists to work on dreams of the future unlimited by politics and hidebound Earth thinking. The heroine meets Frank (George Clooney) as an older scientific genius who was brought to Tomorrowland as a child, but then was exiled for inventing a machine to predict the future, which foretold of disaster to come. They are chased by killer robots to Tomorrowland itself, which is decaying and abandoned. The apparent dictator of Tomorrowland, played well by Hugh Laurie, is the only Tomorrowland resident we meet who isn’t a robot, and he no longer believes humanity deserves to be saved. 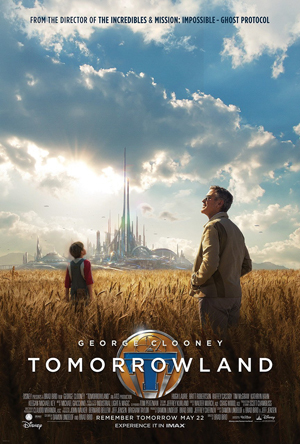 The explanation for the decline of Tomorrowland is never given, but a thriving high-tech colony in 1964 becomes a dystopia in 2015 with a dictator who ruthlessly kills anyone who gets in his way. The movie shows its deep schizophrenia here — having satirized today’s obsession with dystopias and pessimism, it doesn’t even bother to explain why a settlement founded on idealism should turn so sour. The one hint comes when dictator Nix tells Frank it was his fault for not believing. And later it’s suggested that the heroine’s refusal to give up can magically effect the probability of doomsday. So the woo factor a la “The Secret” appears, with the trite metaphor of the two wolves: “You have two wolves, one representing darkness and despair, the other light and hope. Which one lives? The one you feed.” So it’s all about attitude! After much clanking plot with explosions, fights, chases, and other worn-out devices, the bad machine that is creating negative consciousness on Earth is destroyed, and the future looks more hopeful. Nix admits he was intentionally beaming negative thoughts at Earth, expecting they would motivate people to fix the problems leading to Doomsday, but they just reveled in despair and refused to sacrifice convenience. Ahem? The vision is inspiring. But the end is chilling — bad machine destroyed and dictator killed, a new corps of fresh-faced young robots will recruit the artists and scientists of the future to persuade others to apply creativity to fix problems. This bit looks like an Apple commercial, with its gauzily sentimental multicultural recruitees. The laundry list of problems shown as destroying the Earth includes global warming (the melting glaciers and flooding coastal regions are shown), nuclear war, and political unrest. Putting the clues together, the solution is found by persuading people to sacrifice comfort to do what is necessary as instructed by the best and brightest. So a kind of techno-fascism will save the planet! This has little of the optimism we associate with Disney, and a lot of today’s politicized environmentalism. The script loses faith in the audience and resorts to the same old villains, fights, and chases to keep their interest, when the material is fascinating enough without demonizing anyone. As a result, instead of exploring the issues in depth, most screen time is action. It might as well be a Transformers movie for most of its running time. “I just have one more thing to say.” Kat didn’t know where this was coming from, but she had to speak. Aurora looked alarmed. Some of the problems with Tomorrowland seem to have been the result of misguided editing. The filmmakers wound up with a 240-minute movie, and they needed to cut at least fifteen minutes of it. The studio previewed it to a focus group, which told them to cut the explanations and background development and emphasize the explosions and chase scenes. Something that seemed strange to me was that nobody in the movie ever speculated about a different reason for the decline of our civilization: the existence of Tomorrowland itself, because it removed the best, brightest, and most optimistic people from our world. I generally agree with your comments. The schizophrenia of the concept of Tomorrowland and the satirical look at doom-and-gloom and dystopia as the current popular obsession isn’t resolved — it turns out Tomorrowland has somehow-unexplained become a dystopia, because Frank didn’t believe in it enough (wut?) or something. The tragedy here is that Brad Bird left alone would probably have done better on a much smaller budget. But as mentioned by one of the previous comments, they may have calculated that a mass audience wouldn’t be happy withoutlots of chases, fights, killer robots, and conventional suspense. It would have been much more interesting if, instead of being run as a murderous dictatorship, Tomorrowland had simply lost heart — some plot device like loss of willingness to take risks as a result of their life-extension technology. And then the fresh blood from Earth brings hope and a reawakening of ambition… no one gives me $150 million to make movies, for some reason. I rewatched part of it last night, and much became clearer. The ideologies are muddled but it’s (sigh) worth a deeper analysis because this *should* have been the flagship movie that expresses the Disney ethos for the new era with Pixar. They seem to be in trouble, so when I get a chance I’ll rewrite this. One of the key bits is when Nix makes his last speech about the people of Earth not listening to the warnings and failing to act to solve any of the problems; that combined with the amorphous all-disasters-at-once end shown, which seems to include coastal flooding due to warming, melting icecaps, nuclear war, and political unrest, sends the message that the new role of Tomorrowland will be to persuade the people to do as they’re told by their wiser leaders to head off disaster. Kind of creepy, and the science is a mess, with four different ways to transport to Tomorrowland seemingly only to provide visual set-pieces.